Two short videos by science writer Steven Johnson on his book Where good ideas come from: the natural history of innovation. And him giving a TED talk. Steve Johnson has posted some of the responses to his ideas on his blog. This is 100-proof American evolutionist, naturalistic liberalism, which is to say, Pragmatism. It is a celebration of the virtues of openness, experimentation (including failed experiments), giving “slow hunches” chances to develop, to serendipitously blending ideas from diverse intellectual backgrounds and disciplines, and the continuity of human culture and thought with processes in the natural world. It’s a view of the social life of the mind, illustrated by engagingly-told anecdotes from the history of science and technology; apt references to a wide range of scholarly studies; long, admiring quotations from Darwin; the natural history of coral reefs and the evolution of sexual reproduction. (The broader history of culture, especially the fine arts, is occasionally alluded to, and there are abundantly merited plugs for his old teacher Franco Moretti’s studies on the evolution of genres and “distant reading”; but mostly it’s a science-and-technology book.) Johnson has painted a crowd scene: good ideas hardly ever come from isolated individuals thinking very hard and having flashes of inspiration; they come from people who are immersed in communities of inquiry, and especially from those who bridge multiple communities. The picture is an attractive one, which I actually think (or perhaps “fervently pray”) has a lot of truth to it. Defining innovation as “the adoption of new practice in a community,” Professor Denning and Mr. Durham lay out eight practices they deem vital to success: sensing, envisioning, offering, adopting, sustaining, executing, leading and embodying. For each practice, the authors explain its essence, its relationship to specific instances of effective innovation and the pitfalls one is likely to encounter in undertaking the recommended actions. They also include some homework: what to practice for each set of skills. The book is very much a hands-on guide. Its frame is innovation, but, on a deeper level, it is concerned with effective leadership, specifically how people create and sustain change in groups. 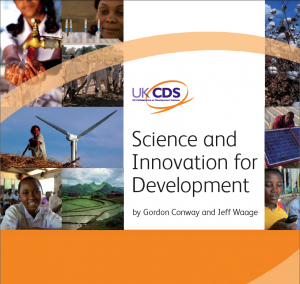 A large part of the book consists of reviews of different technologies relating to development. 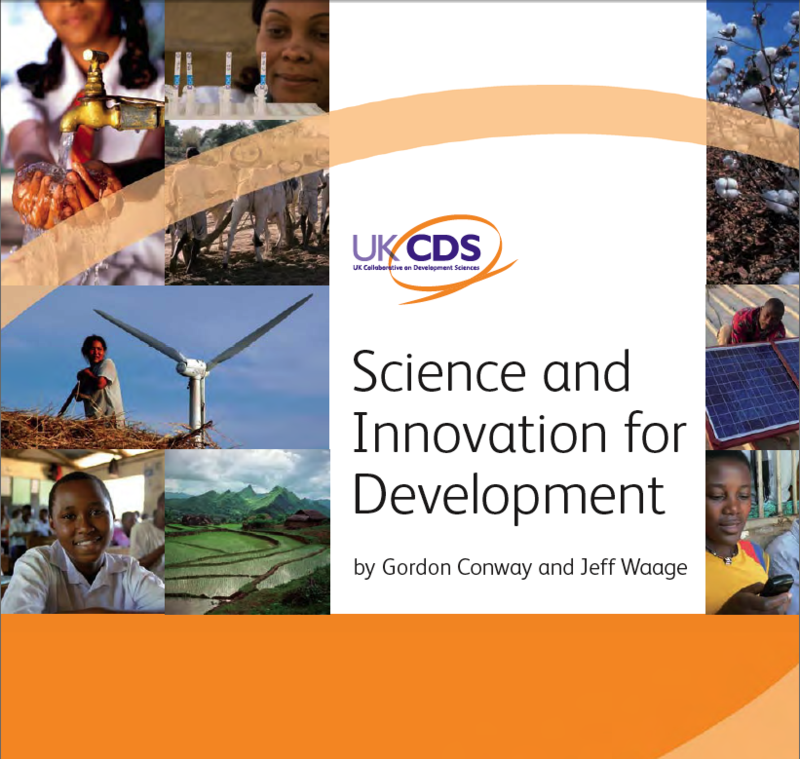 The reviews use the Millenium Development Goals as a starting point, and focus on agriculture, environment and health (with an unsurprising emphasis on scientific/technical aspects, given the authors’ backgrounds). You can download individual chapters, or the whole book, here. Sander van der Leeuw, is archeologist and member of the Resilience Alliance. His talk a the Long Now Foundation in San Francisco, The Archaeology of Innovation is available online as a video. Why does psychological distance increase creativity? According to construal level theory (CLT), psychological distance affects the way we mentally represent things, so that distant things are represented in a relatively abstract way while psychologically near things seem more concrete. Consider, for instance, a corn plant. A concrete representation would refer to the shape, color, taste, and smell of the plant, and connect the item to its most common use – a food product. An abstract representation, on the other hand, might refer to the corn plant as a source of energy or as a fast growing plant. These more abstract thoughts might lead us to contemplate other, less common uses for corn, such as a source for ethanol, or to use the plant to create mazes for children. What this example demonstrates is how abstract thinking makes it easier for people to form surprising connections between seemingly unrelated concepts, such as fast growing plants (corn) and fuel for cars (ethanol). These results build on previous studies which demonstrated that distancing in time – projecting an event into the remote future – and assuming an event to be less likely (that is, distancing on the probability dimension) can also enhance creativity. In a series of experiments that examined how temporal distance affects performance on various insight and creativity tasks, participants were first asked to imagine their lives a year later (distant future) or the next day (near future), and then to imagine working on a task on that day in the future. Participants who imagined a distant future day solved more insight problems than participants who imagined a near future day. They also performed better on visual insight tasks, which required detecting coherent images in “noisy” visual input, as well as on creative generation tasks (e.g., listing ways to improve the look of a room). Similar evidence has been found for probability. Participants were more successful at solving sample items from a visual insight task when they believed they were unlikely, as opposed to likely, to encounter the full task. I’d been asked by the organizers [of the seminar on the Information Society in Barcelona] to talk about how NGOs and social change organizations innovate, with the special challenge that I wasn’t supposed to celebrate innovative projects so much as I was to talk about the process of innovation. As I thought about this, I realized that I a) didn’t have much understanding of how social entrepreneurs innovate and b) didn’t have much confidence that social entrepreneurs generally did a good job of innovating with social media tools. Generally, I think that social entrepreneurs place far too much faith in social media tools and assume that they’ll be more popular, useful and powerful than they actually turn out to be. So I offered a talk about some very different types of innovation – African innovations including the zeer pot, William Kamkwamba’s windmill, biomass charcoal, and endless examples of innovation using mobile phones. My argument was that innovation often comes from unusual and difficult circumstances – constraints – and that it’s often wiser to look for innovation in places where people are trying to solve difficult, concrete problems rather than where smart people are sketching ideas on blank canvases. The most experimental part of a very experimental talk was applying these seven principles to three ICT4D experiments – One Laptop Per Child, Kiva and Global Voices. Ismael has a review of my talk including the scores I offer for each of the projects on these criteria.